Veg manchow soup recipe – This is one of the most popular soup recipes from Indo-chinese cuisine. I love a bowl of it during the chilly winter days. 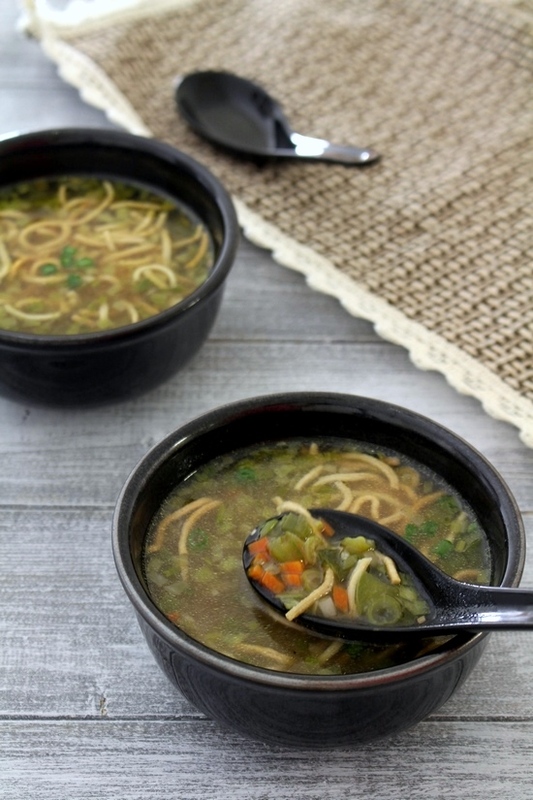 You will find this veg manchow soup in every Indian-Chinese restaurant menu. There is another similar soup recipe you will find in menu too which I have already shared. It is hot and sour soup. Hubby prefers these two soups over any other smooth, creamy soups. Because he is fan of chunky textured and spicy soups. The consistency of the soup is thin compared to hot and sour soup. This is how I have eaten in many restaurants. But in case, if you like thick soup then increase the cornstarch amount little bit. The best thing about manchow soup is that it is topped with fried noodles. I love that crunchy noodles with hot, spicy, sour soup. For making this soup I have used homemade vegetable broth. I highly recommend using it over the water. This gives good flavors to the soup. Since this is thin soup, so all the flavors are coming from vegetable stock and sauces we are adding. Vegetables also add little flavor but it is for texture and taste. 1) First we need to make fried noodles which will go on top as a garnishing at the end. This needs to be pre-planned, as boiled noodles will require some time to dry-out. Then deep fried in the oil. You can find the recipe for fried noodles here. So while the noodles are drying, make the soup. While soup is simmering, fry the noodles. 2) Now make cornstarch slurry. Take cornstarch in a small bowl. 3) Make smooth paste by adding ¼ cup of water. Keep it aside till needed. Also prep all the veggies and rest of the ingredients. 4) Heat the oil in a saucepan on medium heat. Once hot add chopped ginger, garlic, green chili, celery and green onions. 5) Saute for about 2 minutes. 6) Then add all chopped veggies (carrot, cabbage, capsicum, beans). 7) Mix and cook for 2-3 minutes. 8) Now add salt and pepper, stir well. 9) Add vegetable stock or water. 10) Let it come to a boil. 11) Once it starts boiling, let it simmer for 2 minutes. 12) Then add cornstarch mixture. Before adding it into soup, do stir once. Because cornstarch has tendency to settle down at the bottom of the bowl. 13) Mix well and let it simmer for 5-6 minutes or till soup thickens slightly. 14) Now add soy sauce. 16) Mix well and cook for a minute only. Then turn off the stove. 17) Remove the soup in individual serving bowl. 19) Lastly garnish with chopped spring onion greens. Serve the veg manchow soup right away. Add the fried noodles at the time of serving only. Otherwise you will have soggy noodles instead of crunchy. 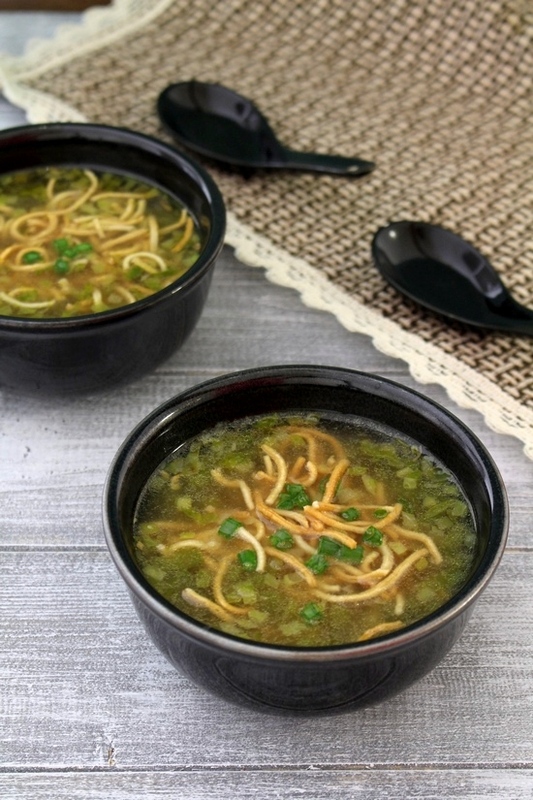 Serving suggestion: Serve this veg manchow soup as a starter for your indo-chinese meal. Or enjoy it whenever you feel like. First we need to make fried noodles which will go on top as a garnishing at the end. This needs to be pre-planned, as boiled noodles will require some time to dry-out. Then deep fried in the oil. You can find the recipe for fried noodles link below. So while the noodles are drying, make the soup. While soup is simmering, fry the noodles. Now make cornstarch slurry. Take cornstarch in a small bowl. Make smooth paste by adding ¼ cup of water. Keep it aside till needed. Also prep all the veggies and rest of the ingredients. Once hot add chopped ginger, garlic, green chili, celery and green onions. Saute for about 2 minutes. Then add all chopped veggies. Mix and cook for 2-3 minutes. Now add salt and pepper, stir well. Add vegetable stock or water. Let it come to a boil. Once it starts boiling, let it simmer for 2 minutes. Then add cornstarch mixture. Before adding it into soup, do stir once. Mix well and let it simmer for 5-6 minutes or till soup thickens slightly. Now add soy sauce and vinegar. Mix well and cook for a minute only. Remove the soup in individual serving bowl. Add fried noodles. Lastly garnish with chopped spring onion greens. Delicious and easy to cook. This recipe is really good. I followed your directions and it tuned out great and it was surprisingly easy to make. Good to hear that it came out good. Finally you made it i have been waiting for this recipe. looks great. yes, I had your request (including other recipes) in my mind. But it took me some time.